Progressive Auto Works of Powhatan has talented employees to help ensure you receive the best quality for your automotive needs. Each one of us take great pride in the detail and craftsmanship we perform on your vehicle. Eddie Hinson is a Master Auto Technician with over 35 years of progressive auto repair and maintenance experience. He offers not only the expertise and ability required in today's sophisticated technologically driven automotive world, but the ability to work on yesterday's cars as well. To ensure quality control Eddie oversees all work performed by our technicians for accuracy. 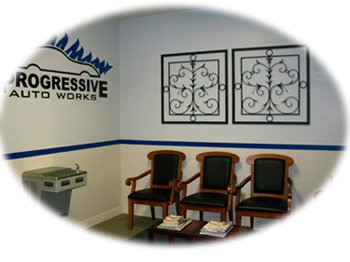 As the owner of Progressive Auto Works he is committed to helping our customers understand the maintenance and repairs we perform. Ben Wise joined us in 2009 and serves as our Service Writer and Assistant Manager. He has an expansive working knowledge of auto mechanics. This combined with his organizational skills keeps our schedule and shop running in a timely and efficient manner. His responsibilities entail communicating with our customers, as well as, our mechanics the issues that effect the automobiles we service. Ben is in constant contact and negotiation with our suppliers to make certain our customers are receiving the best parts at the best price. He manages an endless amount of paper work and an ever changing work schedule to ensure our customers receive the service their car requires in a timely manner. Cody Cosgrove is a 2008 graduate of the NASCAR Technical Institute. He is one of our Master Auto Technicians and State Inspectors. He brings to Progressive Auto Works over eleven years of experience and an extensive knowledge of the automobile repair and maintenance industry. Cody has an in depth knowledge of how a vehicle's complex components work and interact together making him a leader in complex diagnostics. Cody's repair and maintenance knowledge covers all areas including computer, electrical, HVAC, alignments, suspension and transmission. Rick Kampe is a graduate pf Advanced Technology Institute. He is a Master Auto Technician and one of our State Inspectors. He brings to Progressive Auto a degree in auto repair and maintenance along with over ten years of experience. Rick has an in depth knowledge of auto repair and maintenance with a passion for the technical side of the industry. He is continually expanding his knowledge in the ever changing world of computers in the sophisticated auto repair market. Rick's repair and maintenance knowledge covers all areas including computer, electrical, HVAC, alignments, suspension and transmission.